Dimensions 1 by 5 by 7 in. African Americans; Race identity; History. Race awareness; United States; History. Amazon.com description: Product Description: In 1656, a Maryland planter tortured and killed an enslaved man named Antonio, an Angolan who refused to work in the fields. Three hundred years later, Simon P. Owens battled soul-deadening technologies as well as the fiction of race that divided him from his co-workers in a Detroit auto-assembly plant. Separated by time and space, Antonio and Owens nevertheless shared a distinct kind of political vulnerability; they lacked rights and opportunities in societies that accorded marked privileges to people labeled white. An American creation myth posits that these two black men were the victims of racial discrimination, a primal prejudice that the United States has haltingly but gradually repudiated over the course of many generations. 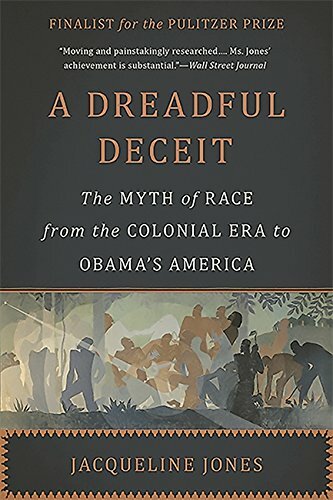 In "A Dreadful Deceit," award-winning historian Jacqueline Jones traces the lives of Antonio, Owens, and four other African Americans to illustrate the strange history of race in America. In truth, Jones shows, race does not exist, and the very factors that we think of as determining it a person s heritage or skin colorare mere pretexts for the brutalization of powerless people by the powerful. Jones shows that for decades, southern planters did not even bother to justify slavery by invoking the concept of race; only in the late eighteenth century did whites begin to rationalize the exploitation and marginalization of blacks through notions of racial difference. Indeed, race amounted to a political strategy calculated to defend overt forms of discrimination, as revealed in the stories of Boston King, a fugitive in Revolutionary South Carolina; Elleanor Eldridge, a savvy but ill-starred businesswoman in antebellum Providence, Rhode Island; Richard W. White, a Union veteran and Republican politician in post-Civil War Savannah; and William Holtzclaw, founder of an industrial school for blacks in Mississippi, where many whites opposed black schooling of any kind. These stories expose the fluid, contingent, and contradictory idea of race, and the disastrous effects it has had, both in the past and in our own supposedly post-racial society. Expansive, visionary, and provocative, "A Dreadful Deceit" explodes the pernicious fiction that has shaped four centuries of American history. About: In 1656, a Maryland planter tortured and killed an enslaved man named Antonio, an Angolan who refused to work in the fields.